Clad In will host oil paintings by Rachel Brask for the months of April and May 2018. This exhibition will feature the most recent “Abstracted Rainy Moments” paintings by Brask, recently painted during a two-week art residency at Truro Center for the Arts Castle Hill’s Edgewood Farm, located on Cape Cod. Throughout the residency, Brask scouted out potential locations and landscapes that she could photograph as reference images to inspire new scenes for her to paint, then to have it “rain” on her painting compositions. There will be an artist reception on Thursday, May 10, 5:30-7:30pm. Come out for some light refreshments, meet the artist, and see how the the shop is curated to have the artwork and fashionware complement one another. One of my paintings from the Abstracted Rainy Moments series has made its public debut in the Surface Tension Exhibition at the University of Rhode Island Main Campus Gallery, on exhibit Octover 11-November 18, 2016. The URI Main Campus Gallery at the URI Fine Arts Center is located at 105 Upper College Road, Kingston, RI. Gallery hours are Momday-Friday 12-4pm. I held a Pop-up Poolside Paintings Preview Party last weekend. What is this event? 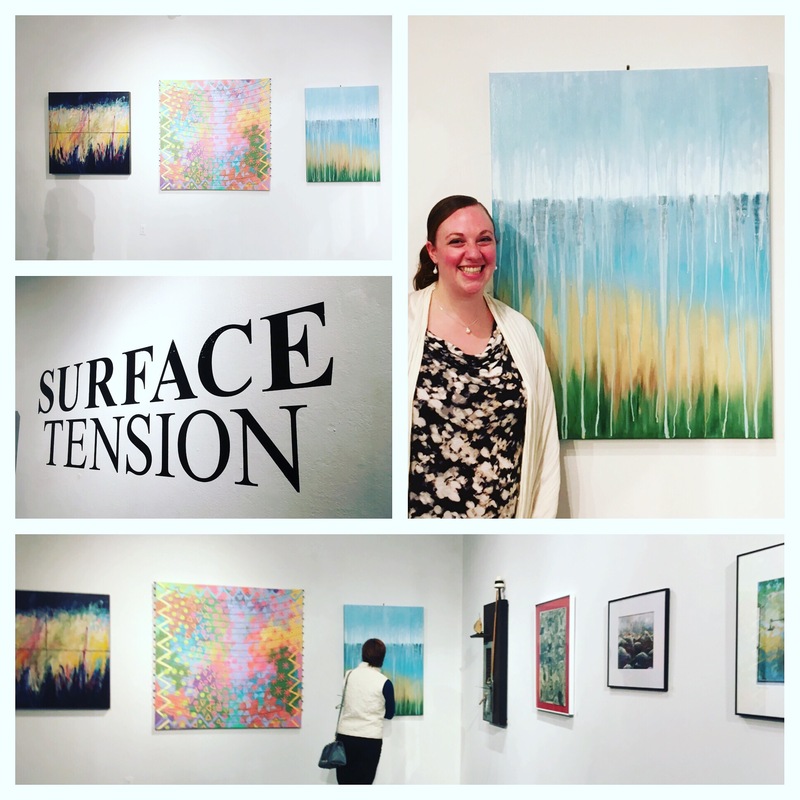 It is a combination of studio reception, part artist talk, and part just summertime fun! I thought up the idea a few months ago when I was thinking of combining two things I love to do –art and having people over for fun & food– as a milestone and celebration for completing 10 paintings in a new series on time. I will get things done if I make a deadline for myself, and having a party to invite people to in order to get paintings done seemed like a good and fun idea. 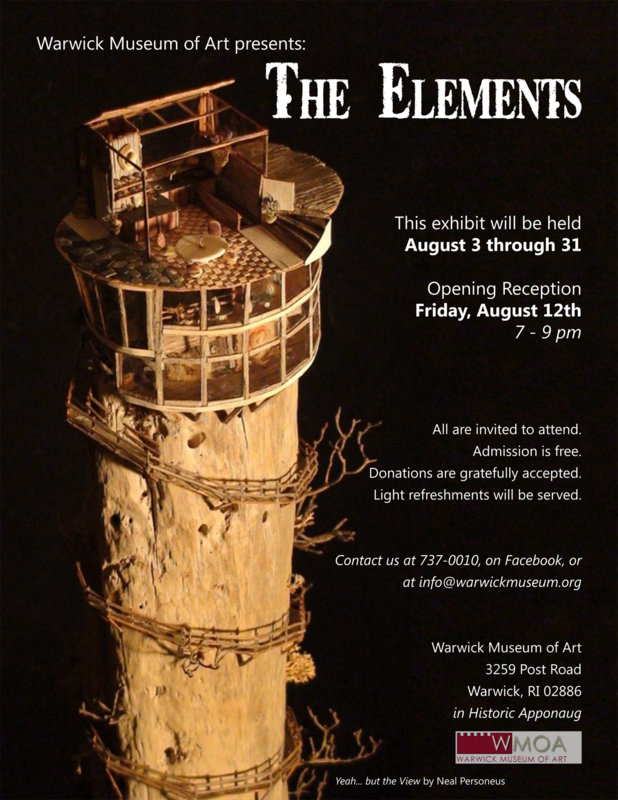 It was an honor to participate in such a lovely exhibition and lively art opening as The Elements Exhibition at the Warwick Museum of Art. The Elements featured artworks within the theme of wind, earth, water and fire. 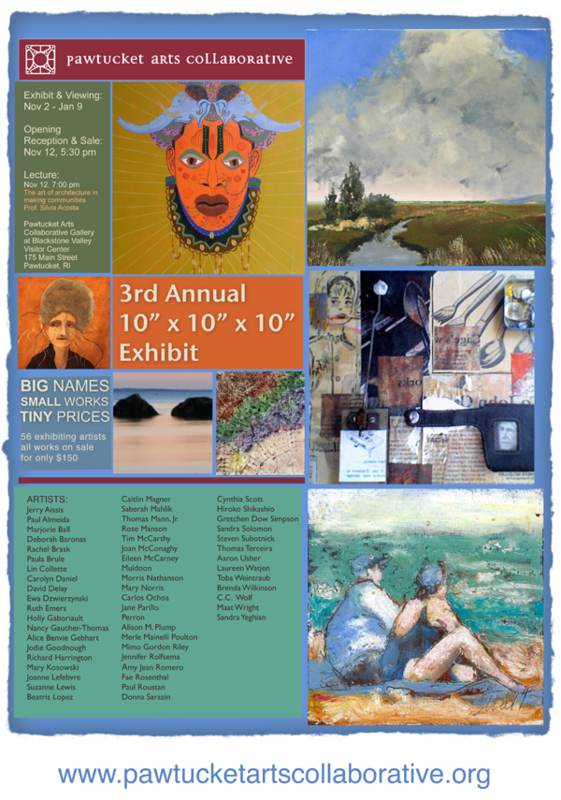 Two of my paintings were selected through the juried process for participation in the show. Looking around at a of the other artwork, I was very impressed with the level of talent exhibited within the space. I also got to meet some other fantastic artists such as photographer, Carol Proulx, sculptor, Neal Personeus, and painter, Carol Scarvotto. The organizers of the show and opening, Courtney Rose and Patti Martucci did an excellent job and it was a pleasure to be present to meet other artists and art appreciators. 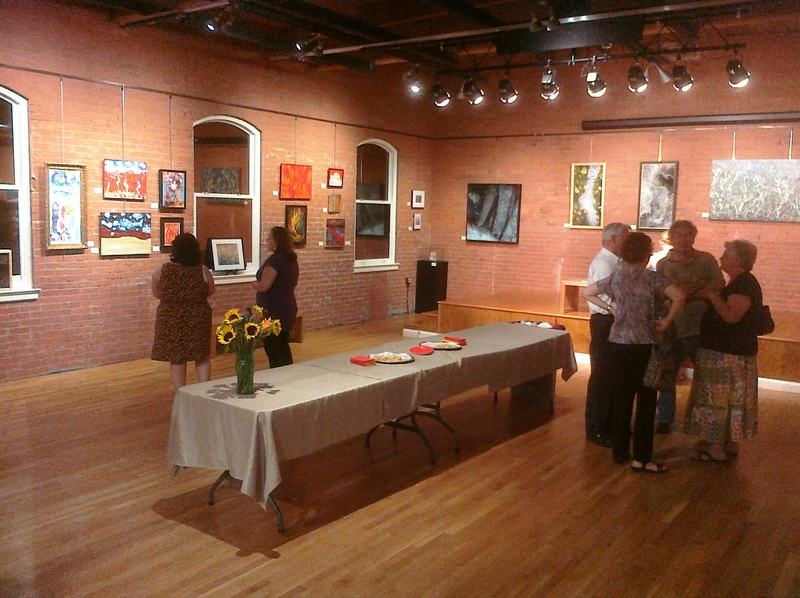 I hope to do another show sometime at the Warwick Art Museum in the future. 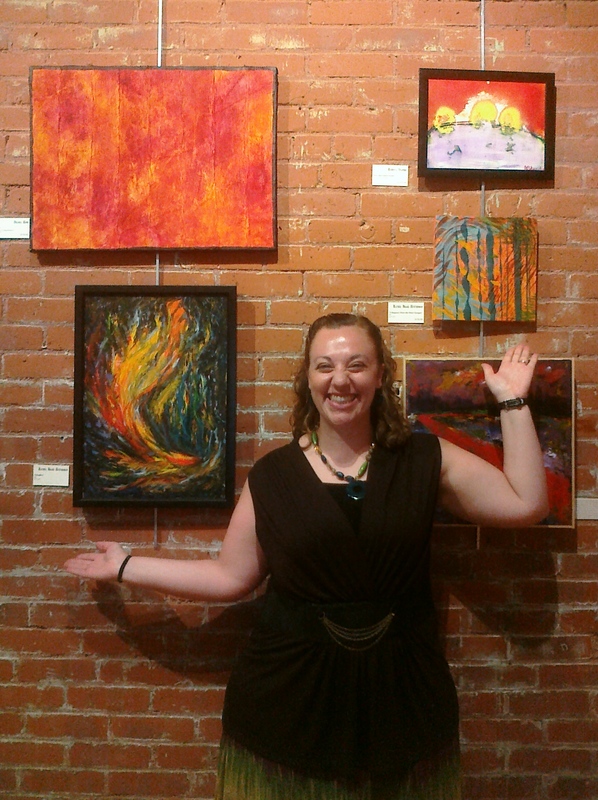 The artist at The Elements Exhibition with her pieces, "Windfire" and "It Happens When the Wind Changes"
All the information you need about the 10x10x10 Exhibition happening on November 12 @ 5:30pm. To view/download the higher resolution PDF, click on the link below. If you haven’t yet marked your calendar for this event, then you absolutely should! There will be featured art by over 50 artists, and each and every piece is sized within 10″ x 10″ x 10″ and ALL are priced at $150. No more, no less. What a great time for buying art!